Delightful holiday home suitable for two families or mature groups . Interior features polished floorboards, 2 kitchens, 2 bathrooms one with a spa bath. Air conditioned. Two lounge rooms, two dining rooms, 2 TV/videos. There's a gas barbeque and outdoor setting at the back of the house. This area leads out onto a large grassed area which surrounds the house. Sleeping arrangements: 2 queen bed rooms and three bedrooms each with two single beds. We also have two folding beds. 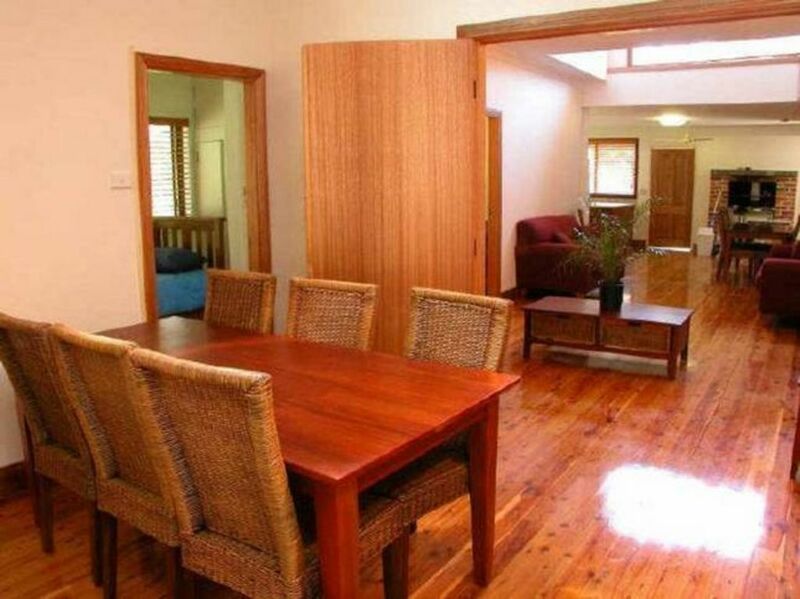 The house is in a great location right on Avoca Lake and a minute's walk from the beach. The house is very safe - it's all on one level, well off the street (which is a cul de sac) and borders on the park which surrounds the lake. There is lots of off street parking for 6-8 cars if necessary. The back area with the BBQ and outdoor setting is fully enclosed for the safety of children. It takes less than 2 minutes to reach Avoca Beach. Head along the lakeside (5 minutes) to the shops & restaurants of Avoca. Walk along the beach to Avoca (South) surf life saving club, shops & cafe. It is only a short walk (1 minute) to fantastic views and waterside access to Avoca Lake. Enjoy views of the lakeside wetlands from the bedrooms and living areas. We had a lovely stay and found the size of the property to be very comfortable for our group of 10 people. Weather was lovely and it was great to sit outside and enjoy the BBQ facilities. Overall, I would recommend this property for a large family or group of friends. More cons then pros. The location is fantastic. Located at the end of the Col-de-sac right near the entrance to the beach and the lagoon. The house is large enough for a massive group, but I believe due to the aging of the house it’s probably best suited for a boys trip rather then a mixed with kids. The cleanliness of the main kitchen wasn’t up to par with cockroach poop and stains throughout the cupboards. We spent the first hour washing everything. I had to run a vacuum over the floors as well. The rooms were clean, however the old mattresses affected all of our sleep and gave us sore backs. Replacement of the mattresses were strongly suggested to the owner. Some of the wardrobes had old smelly mattresses making the storage space unusable. Some of the rooms had enclosed patios which weren’t kept clean with dust and cobwebs throughout. The bathrooms were old but clean. The air con in the main lounge room and the fans throughout the house were a life saver. The front dishwasher switched off when we first used it but it appears to be back on. The front bathroom doesn’t have a window to the outside and vent didnt work. The rear laundry dryer kept stopping during a cycle. The main kitchen fridge, in the freezer compartment. The fan doesn’t have a cover and it’s quite dangerous. We had a good time, but if a lot of these small things were fixed, the place would be much more enjoyable. The first double bedroom wardrobe was so unfit for anything to go in it. some screens in bad state. Great location and comfy house! Great location and comfy house! The only issue is some leaking spots 2 or 3 in the kitchen area, if doesn't fix it now it will become a big headache later. This is a comfortable house for children and very close to the beach. We had a short stay, only one night, but enjoyed ourselves and the fact that there are few breakables. Not fancy but still recommended!